These holiday classics are performed with a savory and romantic rendering on solo guitar--this CD is the perfect Christmas stocking stuffer to be enjoyed throughout the season. 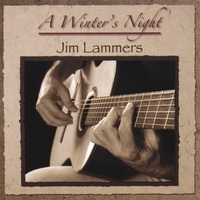 Jim Lammers recorded this solo guitar CD with 11 selections that were chosen for their endearing and timeless beauty. The warm sound of the classical guitar serves a savory and romantic rendering of these holiday classics. Enjoy "A Winter's Night" throughout the Christmas season. Jim Lammers has performed extensively as a solo artist for more than 20 years. His professional performances have been warmly received at public and private functions. His style of playing is best described as a cross between Chet Atkins, Joe Pass, and Earl Klugh. Jim earned his classical guitar performance degree from the Conservatory at the University of Missouri-Kansas City. In addition to his career in performance, he has been a devoted guitar instructor at the Community Music and Dance Academy, UMKC since 1987. Soothing and restful way to enjoy Christmas tunes.